Meet the new Fab Five. Today, Netflix announced the cast for their upcoming reboot of Queer Eye for the Straight Guy. A remake of the successful Bravo series, the reality show features five gay experts as they help a straight man makeover his life, focusing on wardrobe, food, lifestyle, interior decoration, and hair. The original series ran for five seasons before ending in 2007. 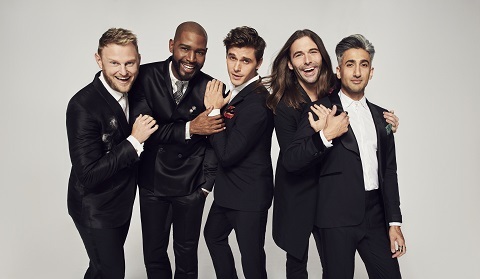 The new cast of Queer Eye includes “Antoni Porowski (Food & Wine), Bobby Berk (Interior Design), Karamo Brown (Culture), Jonathan Van Ness (Grooming) and Tan France (Fashion).” It’s unclear if the original Fab Five will return for the reboot, but the new series is slated to premiere on Netflix in February 2018. What do you think? Are you a fan of the original Queer Eye? Will you watch the Netflix reboot? More about: Netflix TV shows: canceled or renewed?, Queer Eye for the Straight Guy, Queer Eye for the Straight Guy: canceled or renewed? Queer Eye for the Straight Guy: Fab Five Cancelled?